My dog says with the new school year in full swing, he's sure many students will soon be asked to dissect animals in their science classes. 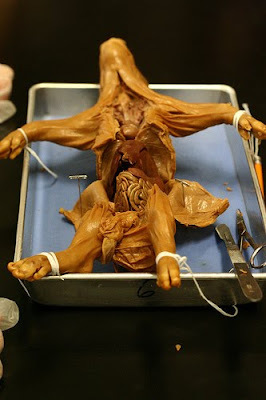 Whether you're asked to cut up a frog, pig, cat, or other animal, many states have policies in place that require schools to provide alternatives for students who don't want to slice up animals (there's a plethora of wonderful software programs out there now!). As a student, it may be hard to find your voice and stand up for what you believe in, but find the courage to do it. To learn more about dissection alternatives and what you can do to opt out of dissection days, click HERE. Thank you for having a heart and compassion for animals <3 You are setting a great example! Thank you so much for leaving a comment and for following my blog! As long as I have bark left in this body, I'm gonna try to help animals! Woof! Maybe while they did some backup of the site data, or some re-modification to the site, the link got changed or removed! It does happen!